There are more vegan restaurants in Salt Lake City per capita than New York City. With New York’s massive international status, everyone assumes it has the most and best of anything on any scale. Statistics will show you otherwise. There are at least 10 vegan restaurants in Salt Lake City (SLC) and 200,000 people. New York has about 80 spots (including juice and smoothie bars) and over 8,000,000 people. NYC would need more than 400 vegan restaurants to keep pace with Salt Lake City. In other words, the Big Apple isn’t as vegan-friendly as most people expect, especially if you’ve lived there as a vegan on a budget like we have. In Salt Lake City, the number grows to over 20 vegan establishments if you included stores and bakeries. We are here to tell you that vegan Salt Lake City is worth your attention. Veganism is trending big time these days. Many are trying to capitalize on it by writing stuff about vegan things they’ve never experienced (nor care to) in order to capture traffic on their otherwise un-vegan friendly websites. Rest assured, we’re vegans writing this for all vegans, vegetarians, and veg-curious, and we want this to be your one-stop resource for all your vegan SLC needs. We lived in Salt Lake City for 4 months via house sitting. Salt Lake City was the birthplace of this website, so it has a special place in our plant-based hearts. We take our ultimate guides seriously, and the only other we’ve written is for Madrid, Spain, where we lived for two years. We have categorized everything by vegan restaurants in SLC, vegetarian restaurants in Salt Lake City, Vegan options in SLC, vegan bakery in Salt Lake City, vegan shopping options, and more. We even list the TL;DR after every entry for the skimmers. We’re budget travelers, so the price point is important. Also, we know what it’s like to be gluten-free (my sister is, former roommates were too, including a celiac). Also an important disclaimer: most places are closed Sundays unless otherwise noted. GF+ = a ton of options, celiac friendly will be noted. $ meal 10 and under. $$ meal 15 and under. $$$ meal 15 and up. These are ten 100% vegan restaurants in SLC, meaning that they serve ONLY vegan food. However, one of our top five vegan food experiences was not at an all vegan place – see the Vegan Options section (below) for more. We love Bud’s and ate here several times. Rarely does a vegan establishment hit that sweet spot with quality, portions, and reasonable price. They serve sandwiches, chips, beverages, and even zucchini cookies – but we’re all about the sandwiches. We were quite pleased with every sandwich we tried, including possibly the best vegan Philly cheesesteak Veren’s ever had (Sam’s not a cheesesteak fan), which consisted of a house made cheese sauce, onions and peppers, over “steak” chunk filling that had just the right amount of savory flavor and chewy texture. The only slightly disappointing sub was the barbacoa. We found that the amount of beans overshadowed the delicate barbecue jackfruit. Philly cheesesteak. DAMN – that house made cheese sauce. Order every sandwich with the sourdough – so fresh and toasty, you’ll wish your mouth wasn’t lined with easily shredded gums. If you’re gluten-free, any sandwich can be made into a salad. Also, Bud’s gets the omnivore stamp of approval: “This is at least a once a week spot,” said our visiting meaty friend. Come for: Great sandwiches, prices, and portions. Good location – walkable from downtown. We recommend: the cheesesteak, the barbacoa, the buffalo – all on the toasted sourdough hoagie. Any sandwich can be made a gluten-free salad. Note: Only outdoor seating/no bathrooms, only open until 5 pm. Vertical Diner, by chef/owner Ian Brandt, is that diner that serves breakfast all day, straight down to the slightly divey American diner decor. It has a large, deliciously greasy menu that also includes beer, wine, and dessert. 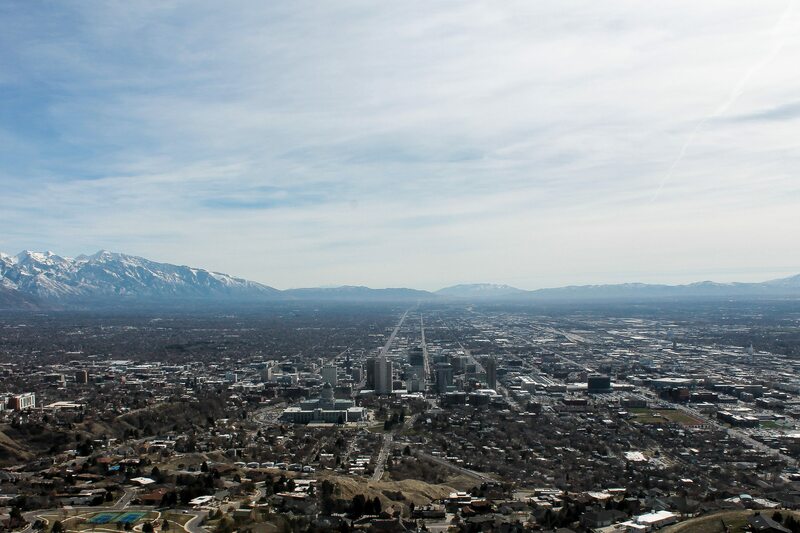 In the first couple of weeks we were in SLC, we went here three different times – that’s how much we love this place. Between trying each other’s (and our friends’) dishes, we’ve sampled most things on the menu. Vertical Diner shines with items that they make in house: creamy vegan cheese, super savory gravy, and anything breakfasty. Like any restaurant, there are stellar dishes and ones that miss the mark a bit, but everything was still very good. Don’t opt for healthy stuff here – they do diner food best. Besides, why would you come to an American diner and order a salad or rice bowl? You order apple-stuffed french toast. And as if they haven’t done enough, many items are gluten-free, and most of the menu can be made gluten-free! Come for: diner style food made vegan, American diner atmosphere, reasonable prices. We recommend: our pick for the best vegan breakfast in Salt Lake City: tofu scrambles, sausage (housemade! ), pancakes, french toast – “The Avalanche” and “Dude Cakes” tick off most of these. There are so many choices, and we’ve tried so many with friends, that it’s hard to go wrong here. Note: They have two locations on 1st and 9th – see website. The newest location was originally Sage’s Cafe (the owner’s flagship restaurant for almost 20 years!) They offer 10% off Meatless Mondays discount for your entire meal (excluding alcohol). This is definitely one of our top three vegan restaurants in SLC. If “Chay” means great, then it’s “All” they deliver (ok, actually chay means vegan, but you get the jist). This spot is located northwest of downtown Salt Lake City but at the center of our herbivore hearts. Everything is right on. The entire menu is fantastic. The seemingly random location has an interior that looks like a former American Legion Hall decorated with what surely must be thrift store paintings. Smack in the middle sits a roundtable that is filled with local regulars. Just walk up to the counter, order what you want, pay, take a seat, and they’ll bring it to you when it’s ready. Help yourself to water, silverware, chopsticks, and condiments (which aren’t even needed as everything is flavored perfectly). Please excuse the lower quality photos. We forgot to photograph with the DSLR, each and every time we went. The food is that good. Vietnamese food is all about bold and fresh flavors. Every bowl of pho comes with bean sprouts, Thai basil, lime wedges, and jalapeño slices. We were especially impressed with how rich and savory the broth was here. Their fried “shrimp” appetizer is great, even if you don’t like shrimp, because it actually tastes better than shrimp. There are several banh mi choices (French bread sandwiches stuffed with raw veggies and “meat”) such as barbecue and lemongrass tofu. All are delicious. Veren’s quite the banh mi fan and has tried many in the Pacific Northwest and the Atlantic Northeast, but their selection and quality take the vegan cake. Or in this case, their housemade vegan flan, with optional coffee caramel syrup. So good you’ll debate ordering more, it’s a good thing that you pay first. The menu specifies which items can be made gluten-free, and staff is knowledgeable and can make substitutions! Keep in mind most soy sauce has wheat. Come for: authentic Vietnamese food made vegan at great prices. Open Sundays. We recommend: any banh mi, any pho, vegan shrimp, noodle salads, Thai iced tea, vegan flan. Again, hard to go wrong here, and impressed all the locals we brought. Note: Open Sundays, and has another location called Vegan Bowl in West Jordan, so if you’re looking for vegan restaurants in Utah outside of Salt Lake, try that one. If you’re staying near downtown, All Chay will be much closer. The spot has great minimalist decor that beckons you to sit down and take your time. The counter help was especially patient, allowing us to wax nostalgia over the options before we ordered one too many, and politely inhaled them all. We love a chill cafe, so this was a big bonus. This spot is a bakery and cafe, so they do have a small menu of savory entrees. For more on the baked goods experience, see the section below on vegan bakery SLC. Note: Outside of downtown, not the cheapest baked goods but well worth it. Regarding pastries, macarons are gluten-free, and a couple of savory café items are gluten free as well. Zest recently became all vegan and it totally makes sense – they have a great sense of serving deliciously plant-based food. Everything is gluten-free and organic. As they’re also a lounge, they have a huge drinks selection. However, it is important to note: this is one of the most upscale and one of the best vegan restaurants in Salt Lake City. Add on the all-organic tag, and it won’t come cheap – add tip and tax and you’ll be over $20 a person. Though it’s worth it as the visiting this place is an experience unto itself. We came here with Sam’s aunt and were able to share many dishes. For appetizers, we had deviled avocados and lightly sautéed Brussel sprouts. Veren’s taco salad with walnut stuffing was especially bright in flavor and tasty. Sam’s zucchini noodles were lightly cooked enough to soften but retain structural integrity. Her aunt’s mushroom stew was super rich tasting. It’s truly vegan cuisine designed by a chef. If you’re a whole-foods plant-based vegan, then you’ll love this spot. That being said, we hadn’t been in a hurry to try this place, and afterward, didn’t plan on coming back. Was it bad? Not at all – please see all the aforementioned. While everything was delicious, the price is a big point for us, and we can’t afford to make this place a regular stop (especially considering the 7 buck subs at Bud’s). A lot of the items definitely take a lot of work and craft with quality ingredients – we don’t deny that. So we try to support all vegan endeavors we can – budget permitting. Come for: Exactly as advertised – fresh, organic, carefully crafted upscale vegan food & drinks. We recommend: anything that’s not a rice bowl, as we make these often at home. Food is meant to be fresh and healthy too, and they will cater to your needs. There’s something for everyone here. The raw elements are particularly well executed. These are restaurants that have opened up recently, so we haven’t had a chance to try them and share our always strong opinions with you guys. If you’ve tried one of these places be sure to let us know in the comments below! New vegan Utah spot by the people at Bud’s, keeping with their tradition of great food at cheap prices. Expect offerings like tacos, quesadillas, and burritos with tons of house-made ingredients. They also offer a huge selection of beers too. We’re big fans of Bud’s, and we can’t wait for a chance to try their new spots (this, and Monkeywrench – see bakery section below). Note: Has gluten-free options, just ask your server. A new all-vegan Chinese spot! Expect all the usual fare, egg rolls, potstickers, lo mein, fried rice but all made vegan, with some other more popular Asian dishes like Papaya salad, pho noodles, Pad Thai, curries, stir-fries – the selection is staggering. Entrees come with a choice of four proteins: tofu, soy chicken, soy beef, and soy shrimp. The tofu seems to always be the cheapest option. Come for: a huge selection of staple Chinese dishes plus others at great prices – seems everything is under 10 bucks! Note: Try asking your server about gluten-free options. This brand new spot seems to be making a run for Zest’s money. They call themselves “gourmet comfort food” and the menu looks exactly like that. Expect bistro usuals like fresh pasta dishes, ribs, salads, and the like. A lot of ingredients are made in-house and are explicitly listed as such. Therefore, we think the best way to go for a place like this is to go for something you don’t find elsewhere and with maximum housemade ingredients. They are pricey like Zest, but unlike Zest, aren’t entirely gluten-free, organic, nor high raw. Come for: what seems to a be a less health-focused, more comfort food oriented competitor to Zest. Considered one of the best Salt Lake vegan restaurants. Note: Not entirely gluten-free like Zest, but offers a few dishes that are already so, and can do gluten-free by request. They don’t want any other modifications otherwise, unless due to an allergy. This little flower of a spot offers fast vegan comfort food at a more affordable level than Zest or Seasons. Here you can expect an assortment of burgers, fries, nachos, tot-chos, and the like, but with a very vegan attitude (Not-yo-cheese, for example). There is such a great selection of vegan bakeries in SLC that we have to give them their own section. A few of them serve lunch and dinner, so for info on that see our restaurant section. For baked goods – keep reading! Bakeries offering vegan options will be in the vegetarian restaurants in SLC section. Where to start? There’s a world of cinnamon buns, rolls, sticky buns, danishes – what it’s called usually sets up your expectations. It’s a delicious hot mess of a softness and gooeyness. Here, expect hand-rolled freshly baked, soft as a cloud, Cinnabon style cinnamon rolls – but dare we say better? They are all vegan, no dairy, no eggs, and including using sugar that’s not processed with bone char (Jesus H Christ is everything processed with animal parts?). They use palm oil but it’s sustainably sourced. It’s a franchise and we’ve tried them in Berkeley, California, and Jacksonville, Florida. They’re amazing, and this is an experience you can’t miss, so consider yourself lucky to find yourself in Salt Lake City as there are only 23 locations in the USA and 5 in Canada. Come for: the best damn fresh cinnamon rolls. We recommend: keeping it simple – who needs toppings? Just get it iced with Oldskool – though it’s hard to go wrong here with the dozen flavors. Note: they’re an ever-growing franchise but don’t let that deter you – it’s a must-try. They are currently not serving any gluten-free products. We first experienced Cakewalk when they shared a space with the late Frisch Compassionate Eatery. Now they frequent pop up markets, festivals, and can be ordered online or found in Jade Market. They have a range of goodies including cookies, brownies, cakes, but especially their signature Dillos aka vegan Twinkies. The carrot cupcake was super moist and the icing made in a cream cheese style. Possibly the best vegan carrot cake we’ve ever had this side of the states. And the Dillos! A red velvet cake with the same cream cheese filling, everything tasted beyond expectations. You can even find these Dillos in the all-vegan grocery store Food Fight in Portland, Oregon. Which we bought and ate there too, of course. Come for: Great baked goods at decent prices. We recommend: Dillos though don’t miss anything from Cake Walk. Note: You can order treats to be shipped, even wholesale, though check their website to make sure they’re doing local deliveries. We never thought we’d have bagels with cream cheese, pizza, glasses of milk, and most pastries, including Veren’s beloved croissants, ever again, when we converted to plant-based paganism. Fortunately, veganism has come a long way since. Passion Flour is part of this new vegan generation. They offer plain croissants, chocolate croissants, “ham” and “cheese” croissants, sticky buns, quiche, and more. This is not your corner store bakery – Passion Flour calls itself a Patisserie for a good reason: the proprietor is a trained French pastry chef, and the proof is in the pastry. A croissant should be layered, flaky on the outside, and buttery in the middle. Half of the experience is texture, and the flavor should border on the fine line between savory and sweet. Veren the Croissant Connoisseur (thanks to his French grandmother) was not disappointed. The sticky bun was soft and sweet, and the quiche had a flaky crust with rich filling. Our favorite thing about this place is that it’s all vegan but you wouldn’t know it by passing by or even walking in. Except for a discreet V in the corner of the window, there is no indication or flag waving in your face. This is a trend we hope new vegan places continue. Everything has a clean layout, and the menu is straight to the point: donuts. The glass display case resembles more a jeweler than a bakery, and their gems are proudly on display. Oh, and the donuts tasted great. We prefer yeast risen ones but they offer cake donuts as well. Honestly – why aren’t donuts all vegan yet when they can taste this good? Come for: Super chic layout, elegant, delicious vegan donuts in Salt Lake City. We recommend: Their donuts of course. The simpler the better, and prefer one icing and/or topping max. Though they have dozens, some even filled, and others like fritters and bars. Note: get a dozen and recieve a 10% discount – that’s a free donut! City Cakes is a solid classic American style bakery with tons of gluten-free options with cookies, brownies, cupcakes, and cinnamon rolls. We had a chocolate chip cookie and brownie on our first visit. You can also buy their cookie dough, sauces, and other pre-made yumminess there. Sam’s not ashamed to admit that she ate almost a whole tub of their cookie dough in a couple days. Come for: Classic American baked goods, cheap. Many gluten-free options. We recommend: the cookies, the cakes, the brownies, a tub of the cookie dough. We weren’t too impressed with the savory entrees, so consider saving that cash for the other great vegan food in Salt Lake City. Note: has locations in both Salt Lake City and Draper City. Same people behind Bud’s and Boltcutter bring you an all vegan ice cream parlor that’s explicitly “anti-dairy”. Has tons of house-made baked goods along with coffee by Color Coffee Roasters. Expect to find milkshake, sundae, and your usual scoop options. Come for: vegan ice cream, of course! Note: open late. Lots of gluten-free options. Surprisingly, there are no places that advertise as vegetarian restaurants in Salt Lake City that are not already entirely vegan. The following places serve honey, but are otherwise vegan. We kept meaning to try this raw chocolate place, but the prices just pushed it off our budget traveler radar. They call themselves a “bean to bar” chocolate establishment and source their organic, fairtrade, kosher cacao from a cooperative involving indigenous peoples in Peru. Their whole setup is impressive. They never use soy, gluten, dairy, or egg, but their primary sweetener is honey. But! We still champion their right to make fancy raw artisanal chocolates, and understand that they don’t come cheap! $9 for a peanut butter cup! If it weighed a pound, then maybe we’d consider. Do know that many people rave about them. The staff is familiar with which chocolates do not have honey – just ask. Note: Although their home base is SLC, they have dozens, if not almost a hundred locations that carry their chocolates, even across the continent in NYC! Looks like we may just have to try them. Two words: juice flights! Vive serves high-quality cold-pressed juices, nut milks, and cold brewed coffee. Nothing is heated, so everything is super raw. Practically vegan too as they only serve honey which is explicitly noted on products. We had our first actual visit to the downtown location during a gallery stroll (more like gallery drive, as places are too spread out in SLC to walk all in a night), that happens every third Friday. There was a great community vibe, with the DJ spinning some juicy beets (pun intended). They had tasting juice samples out, so naturally, we tried them all. Very earthy, fruity, and vegetably. Set up in a corner was a communal painting (to be auctioned off) on which anyone could paint, and at the end of the auction, the highest bidder never even claimed it, so it still hangs at Vive. We were sold just on that experience, so we came back with a friend and ordered juice flights. Even our least favorite juice tasted amazing. These places are not cheap, and we can’t afford to visit regularly, but we wish we could and we’re glad they exist. Come for: Nice chill café atmosphere, great juices, sells vegan beauty products and t-shirts, all high quality. Three locations. We recommend: any juice, but don’t miss their nut milks – especially the vanilla almond and the raw latte. Note: Three locations, with two in SLC: downtown and Sugar House. They also are working towards zero waste and participate in a bottle exchange program: bring your empty Vive bottles for a refund! These are great spots to go to with your non-vegan friends, or for particular items that are not available or done as well at the all-vegan spots. Salt Lake is so vegan-friendly that even places that aren’t 100% plant-based offer amazing vegan food and sometimes separate vegan menus. The options blew us away, from an authentic, entirely vegan Mexican buffet night to a pizza place that more than satisfied the craving for thin-crust NYC-style pizza. Here we will focus on the most vegan-friendly restaurants in SLC, not places that just offer the usual tired vegan options (like salad, fries, and tasteless veggie burgers) and avoid listing chains like Chipotle, PF Changs, and other boring interstate crapperies. Our attitude is this: with so many 100% vegan places, give us a damn good reason to try your vegan options. These ones below make the cut. If you told us that there was a vegan buffet that served maybe half a dozen items, we’d be ecstatic. Now if that buffet turned out to be authentic homemade Mexican cuisine veganized by PETA’s famous Sexiest Vegan of 2015, Victor Ivan Barragan Razo aka The Solar Fire Ninja, with a selection of over two dozen items, we would need a word that means beyond ecstatic. And that’s what we found in SLC. Mi Ranchito has been around since the eighties, with frequent regulars forming the backbone of the clientele. The place is huge, with 3 dining areas: two on either side of the entrance, and an even larger room in the back. They offer traditional Mexican food, with buffets on weekends. The vegan buffet was born when Victor came in autumn 2015 and suggested it. Under his guidance and direction, a new vegan menu was born, including the Friday all vegan buffet. So far the turnout has exceeded expectations. The owner has been very pleased too, as the vegan buffet is cheaper to produce than the regular version. Many Mexican meat dishes require hours of labor to prepare, and high-quality animal products don’t come cheap. With the money earned, they’ve been able to commission an artist to create murals and handcrafted chairs and tables. We cannot rave enough about the food here. If you think that buffet food can’t be high quality, you clearly haven’t tried this place. This is not Golden Corral or Chuck-o-Rama (seriously, who thought up that name?). There are three kinds of stir fry for fajitas (see the homemade tortillas), three kinds of enchiladas, two tamales, two types of rice, black beans, chips, salsa, GUACAMOLE, corn on the cob, fruit and a salad bar, all of which is fresh. They even have non-traditional (to Mexican cooking) items like maduros (fried sweet plantains), roasted potatoes, candied yams, and soups. There’s rice pudding, and they’ll also put out an additional dessert, like ice cream in a freshly baked cookie taco. If this wasn’t beyond enough, all this can be yours for only $14 and it comes with unlimited horchata. If it’s Friday night from 5 – 10 pm, the buffet is all vegan. Presumably, you can still order the regular menu, if your non-vegan friends are so inclined. But we’ve heard from Victor himself that many have been converted to the veggie club by the sheer deliciousness of the food. We even came twice and expect to miss this place sorely. We recommend: the vegan buffet only on Fridays. Vegan menu available all other times, but the buffet is an experience you can’t miss. Note: A bit of a trek from the SLC center but totally worth it. Ask the server about their gluten-free options. This spot did originate in Utah. They now have a bunch of locations all over the state and Florida too. Come for: If you’re want to eat something like Chipotle, but want to try something Utahn. Note: Many locations – see website. This place has some of best NY style pizza outside of New York. It’s so good they have lines at lunch in the downtown location. Furthermore, it’s a Utahn establishment, so definitely give it a try. Fortunately, we tried Este when visiting Park City and had a much more low-key experience than the crazily packed downtown location. There are no vegan restaurants in Park City, but Este has a separate all vegan menu. We ordered the lasagna pizza and were in vegan pizza heaven. Unless you’re using homemade cheese, the trick to doing vegan pizza right is lots of toppings, and not overcooking as plant-based substitutions rarely require actual cooking. Order yourself a pie or two, right next to your lactivore friends – you won’t feel left out. They also serve vegan chicken wings with homemade vegan ranch. Come for: New York style pizza (and we’d know since we’re from there) – the best vegan pizza in Salt Lake City, in our opinions! We recommend: pizza, of course! Go for stuff with homemade toppings, like the meatballs on the lasagna pizza. Plan to split a pizza with a friend, as vegan slices are limited if at all offered. Note: Has three locations – two in Salt Lake City, and one in Park City. Also has a deli location that just serves sandwiches. They also serve Daiya cheese, which is hit or miss for many vegans. They also serve a gluten-free crust upon request. This was an oasis in a desert of storm clouds relentlessly chasing us on a Sunday evening when nothing is open in SLC. We were with Sam’s aunts, and needed a place to duck into and eat. They offer a lot of options, including Vietnamese, Thai, classic American Chinese, and they have a separate vegetarian menu. We didn’t see any explicit dairy ingredients, so we ordered classic sesame “chicken” and “beef” with vegetables. We found out later that the imitation meat has egg in it, so vegans take note. You can sub tofu for any dish though, or even just have them make anything with all veggies. They also had great Thai and Vietnamese options: we got to try the red coconut curry with tofu and veggies as well as the lemongrass tofu with veggies. Both of these were done authentically as well. Come for: super veggie friendly Chinese and southeast Asian dishes with tons of options at great prices. We recommend: coming here with omnivores who refuse to eat vegan food on Sunday – most places are closed on Sunday. Note: Vegetarian and Non-vegetarian menus. Good prices. Open Sunday. Imitation meat contains egg – can sub tofu for any dish. If you’re into the more common subcontinental food of India, Nepali cuisine will feel familiar: lots of curries, fried things, and rice. We went to Kathmandu for the lunch buffet. It was delicious, with ingredients listed on every item, and virtually 80% of it was vegan and gluten-free. There were at least 4 vegan entrees, like coconut curried chickpeas, something with spinach, yellow lentils, a couple of salads, fried potato and veggie chunks. There were two meat items at the end, and there were a few items made with cow’s milk. So we had plenty to choose from, and ate several plates between us, with Veren doing most of the damage. The restaurant had a very relaxing ambiance. The staff was very friendly and genuinely interested in our enjoyment of the food. All the windows were covered with tapestries, and statues and ornaments adorned the walls. They even had a couple of HDTVs playing photo slideshows of presumably Nepal, with a variety of contributors (guessing on the varying styles of composition). The lunch buffet is a fair price, and the food is fresh and well made. This isn’t food we care to eat regularly, as with the fried-ness, the oiliness, and spice, it can be heavy duty for your gut. So the arrangement isn’t quite a steal, and if you can’t eat several people’s worth of food like Veren, you’d probably be satisfied going in for an à la carte lunch or dinner. We recommend: the lunch buffet is most cost-effective, and you get a good variety. Though we can’t imagine the dinner entrees being a disappointment. Note: lots of a fried and very spicy food – bring your tums. Even Steven’s is a local Utahn quick-serve chain with two very well-intentioned vegan options. This is a sandwich spot, so having more than one vegan option is extra vegan-friendly in our book of Plant-based Practicality. AND TATER TOTS (note: the brava tots come with egg mayo). Their name comes from their philosophy, not the old Disney show. For every sandwich bought, a sandwich is donated, and they’ve donated over 600,000 sandwiches thus far. Come for: cheap, good quality, a couple vegan sandwich options and sides too. Live music on Thursday and Friday evenings, and Sunday afternoon. We recommend: either of the two vegan options the Hummazing sandwich or the Jackfruit Torta, but just know – Bud’s is way bettter and all vegan. See entry above. Note: several locations – see site. You can’t eat out all the time – we certainly can’t, nor would we want to. The key to sustainable travel for peons like us is affordability. So that means you’re preparing at least eighty to ninety percent of your meals at home. Read on for our review of SLC’s impressive array of grocery stores, all with tons of vegan options. This is what Whole Foods wishes it was. It’s like Trader Joes and Whole Foods had a baby but bred out the Wholly terrible customers. It’s as cheap and sometimes even cheaper than Trader Joe’s, but with better produce than TJ’s. They even have their own line of products AND 72-hour sales where their prices just get insane, like ten plus pound watermelons for two bucks! Sprouts ain’t playing. The defining characteristic of this place is that produce is smack center, with bulk items in front, and groceries off to the sides. They have tons of vegan products everywhere you look. The usual supermarket staples plus many more. That being said, there’s almost always a line here. And not just ‘cause they’re popular. The cashiers aren’t moving at the lightning speeds most of us are accustomed to at big generic supermarkets. The customers follow suit, ambling around and leaving an obstacle course of shopping carts. Opt for the smallest cart possible. That also being said, we love Sprouts. Come for: Possibly the best place for produce, sales, and selection of products, reusable bag discount. Note: Things move a bit slower here but that’s okay. The employees seem much happier for it. If Sprouts isn’t enough, two Salt Lake City sized (read: massive) blocks away is this large yet modestly presented natural health food store. Their produce is exclusively organic, and the rest of the grocery is reasonably priced – still cheaper than Whole Foods. The big clincher is the discount items and clearance items. Stuff nearing their expiration date gets the price chopped to half, and “unsightly” (edible but not pretty) produce get stuffed into $2 price fixed bags usually weighing several pounds – great considering nothing organic is under two dollars, except a fistful of wheat grass. Even non-sale items are competitively priced. We consistently found organic halawi dates for 3.83 per lb, when they’re usually $ 7/lb, and at Whole Foods where it’s $ 9/lb. Also, their base price for vegan products was generally cheaper than Sprouts, and they’ll sometimes carry more specialty products than Sprout’s. Basically check between these two stores and you’ll find all your specialty vegan needs. The staff are genuinely friendly, and never in a hurry. Bring bags as they don’t have any. If you forget, you can use one of the cardboard boxes they keep for that purpose. They also host community events, like food tastings and workshops. Come for: Great selection, especially for specialty items, discount, clearance, all organic produce. Note: Bring your own bag cus they won’t have any! Basic, run of the mill supermarket. Best for staple goods and stocking the pantry. Expect to see every type of person, because dependably good prices never go out of fashion. The cashiers are high schoolers, and the self-checkout section is madness. Conventional produce is cheapest here. Come for: Cheap produce and consistent cheapest prices on basic items (like soy/almond milk). If you don’t know Joe, we don’t know you. They’re reliably cheap, even for specialty products (if they have it), and the stores are run like well-oiled machines. Staff are always willing to help. For us, TJ’s is about key items: frozen fruit, coconut oil, nuts, sprouted tofu, tempeh, fair trade organic coffee – are the cheapest here. But when it comes to produce, Sprouts undersells them. Come for: Free food samples (read: coffee), great and cheap prices for their products. Note: not the best for produce. You’ll know you’ve arrived when you go through the giant Chinese style gate to the parking lot. If you’re looking for East and/or Southeast Asian food, it’s here. If anyone else has the same product, it will still be significantly cheaper here. We like to stock up on rice vinegar, nori, jasmine rice, sushi rice, sweet rice, frozen no msg dumplings, veggie buns, ginger, and Chinese eggplant here. Come for: Lots of yummy, cheap Asian grocery and specialty items. There’s a ton of places to get your vegan SLC on. SLCvegan: This Facebook group is huge and very active. They’ve been helpful in sharing this article when we originally posted it, along with helpful critiques. If you’ve got a vegan question, they’ve got a vegan answer. Friendly Food Truck Family: Food event that does a round up of vegan food trucks. HappyCow: Of course, no visit to any city should be without a look into happycow. It’s what we do every time we go somewhere, new and old. Velo City Bags: Handmade vegan bags literally handmade by this couple. Designed for the rugged urban Utahn on the go. Products are made locally but sold online as there’s no storefront. Gastronomics Vegan SLC list: At the bottom of this article there is a list of places with separate vegan menus. This is not a vegan site nor vegan-friendly – the first page of generous meat slices will attest to this. Though if you want to best vegan food, we recommend you stick to the all-vegan places. Have you been to Salt Lake City or would like to go? Any vegan restaurants in Utah worth a visit? Please comment with your recommendations for any new vegan spots or places with vegan options that we have missed – that way next time we’ll know where to go! *Editor’s note: This post was originally posted in July 2016 and has since been updated tremendously.